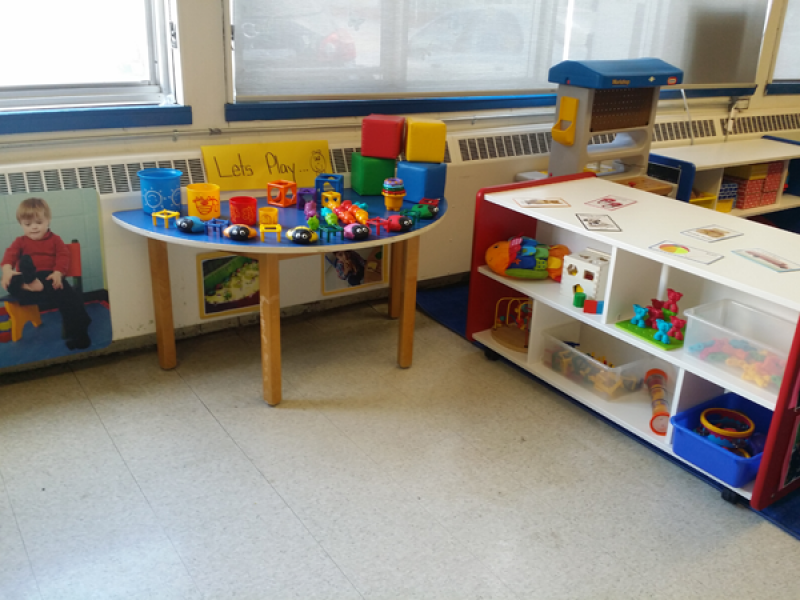 When ‘Sarah’* joined the Toronto District School Board Rexdale CNC program, she did not engage with either the children or the toys in the room. Diagnosed with autism, Sarah needed different supports. The child care staff welcomed her with open arms and wanted to help her integrate into the program. They started off with keen observation, hard work, and a request for funding. In the end, they improved the CNC experience for not only Sarah, but the other newcomer children as well. When the child care team observed Sarah, they first noticed that she didn’t play with other children and was never interested in toys that were out on the carpet. But they soon realized that Sarah did seem to enjoy playing with the toys if they were on a table! That led the team to make their first change. They brought in a smaller, more appropriate table where she could sit and play with the toys. They hoped that this would spark her interest and get Sarah more involved in activities. The team working with her – Arazi, Hamideh and Sandra – also watched to see what types of toys Sarah seemed to enjoy. 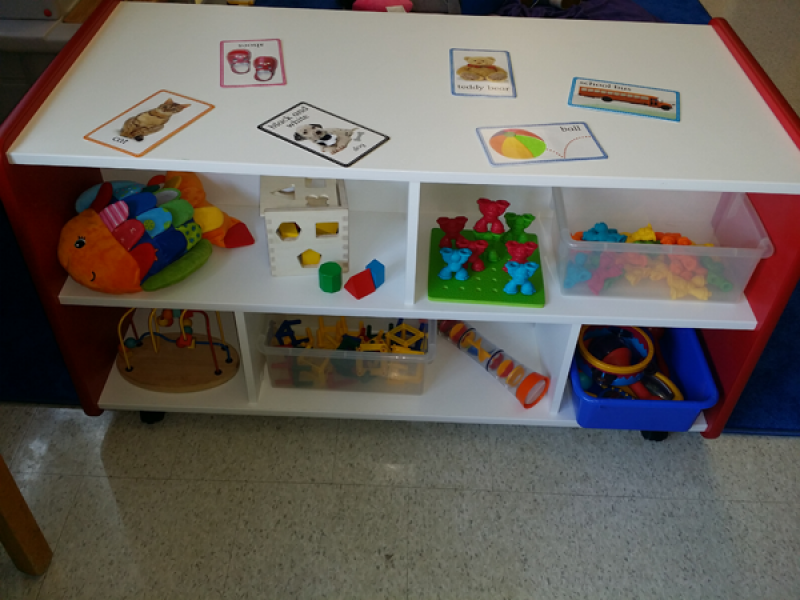 She liked manipulative and sensory toys, so they created a shelf of “Sarah” toys in her table area. 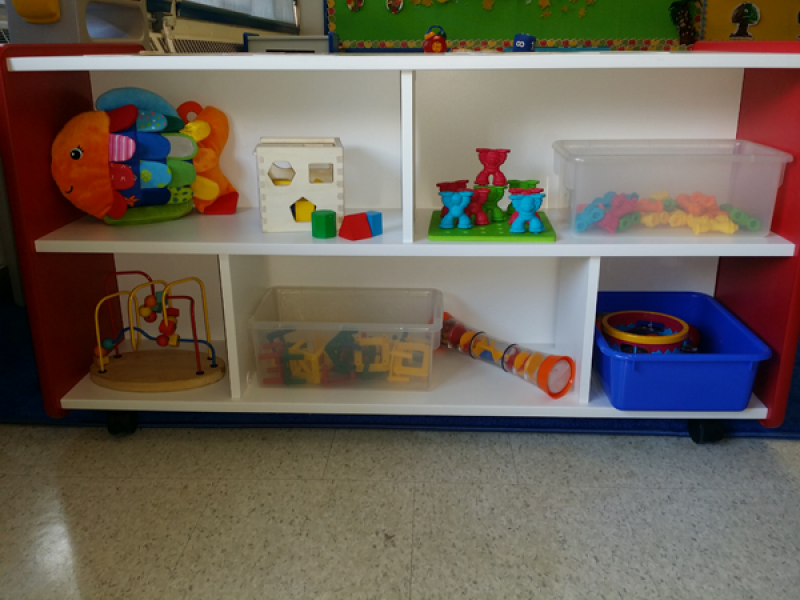 “We thought, ‘why not add a shelf with toys that would stimulate her and that she would enjoy?’” recalled Sandra. 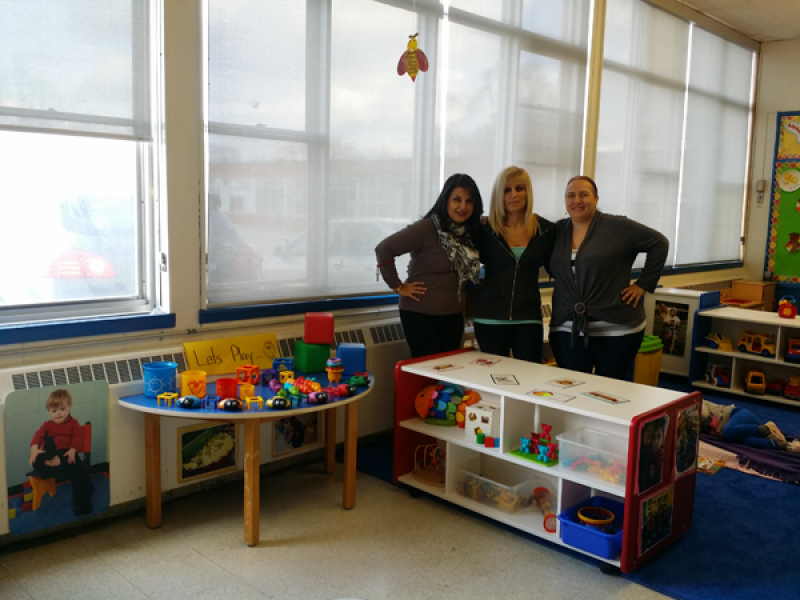 They contacted their LINC Program Officer, Rosalia Settino, to ask for a small budget to buy some toys. After their request was approved, the next step was to figure out what toys would fit her needs. To get ideas, they spoke to Sarah’s mom and her special needs consultant (from outside of the program). They also considered their own observations. In the end, they chose a selection of toys that would interest and captivate her. Even though Sarah is a toddler, many of the toys selected were ones typically used with infants. This included stacking and sorting games, shakers and musical instruments. The toys give Sarah a chance to develop cognitive and fine motor skills. 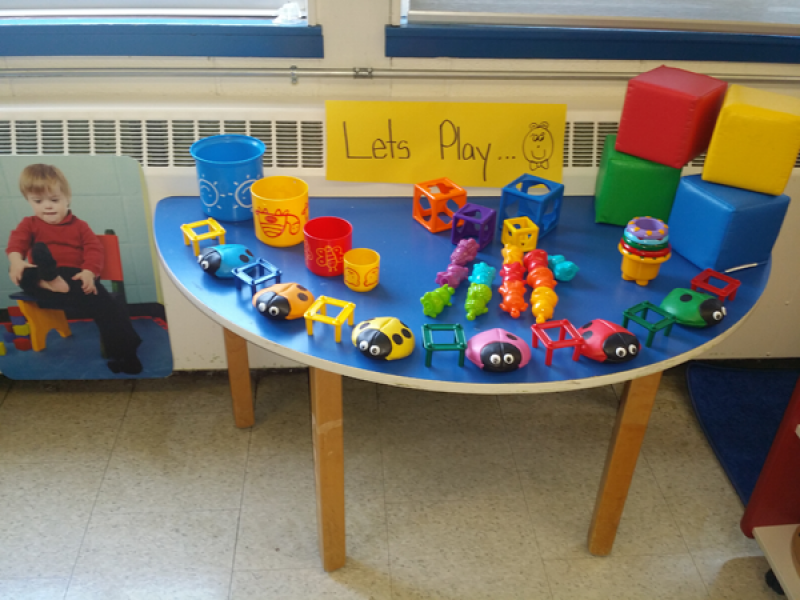 Many of the toys purchased are for sensory play. Sensory play supports cognitive development in children with autism. However, it is also a great source of comfort for others in the CNC program – especially refugee children who have experienced trauma and children with sensory motor challenges. So, it was no surprise that the toys also started to attract the other children in the program. Two brothers, recent refugees who are new to the program, also spend a lot of time there. It’s a soothing area for them, where the toys give an immediate and tactile response. Sarah and her friends also love textures. The staff make their own playdough for the children to enjoy. They divide it up and put out individual packages at the table. “Her mom is so happy her daughter is being included and learning as other kids are learning,” explained Sandra. The shelf has become a treasure trove of ideas for Sarah, filled with all the toys she enjoys. She can take one to the table and then bring it back to the shelf, which is helping to foster her sense of organization. It is a special, inviting place for her, and others within the program. Although the caregivers encourage her to move around, she always goes back to that area and is much more engaged. Given her love for sounds, the staff also tried something new to engage Sarah. They make up songs and sing when they have instructions or something to tell her. It seems to get her attention and help her understand. So now they have a way to help her during transitions and keep her connected with activities! Through observation, working with other professionals and a commitment to meeting the individual needs of each child, the program was able to create a welcoming environment for Sarah.